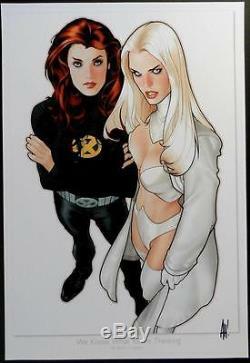 A d a m H u g h e s "Jean Grey & Emma Frost". 13"x19" (32cm x 48cm). Perfect for Framing or Display! The item "X-MEN JEAN GREY & EMMA FROST SDCC 2015 ART PRINT Signed by Artist ADAM HUGHES" is in sale since Thursday, November 05, 2015. This item is in the category "Collectibles\Comics\Original Comic Art\Other Original Comic Art". The seller is "x-worldcollectibles" and is located in Dublin, California. This item can be shipped worldwide.